Located in Puerto De Alcudia, The Bellevue Club is a village unto itself; 17 individual buildings consisting of apartments and studios, all catering to their guests with area specific modern amenities. The layout grants the location a particularly relaxed, community atmosphere, offering a wealth of facilities in and around the surrounding area. The local layout is that of a typical Andalusian village, with entertainment outlets, restaurants, and shopping centres to keep all types of guests happy, be they families, or couples. 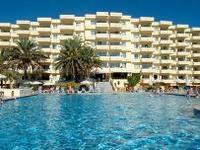 The complex is situated 60km from Palma Mallorca Airport, 14km from Port De Pollenca, and 3km from Alcudia. Facilities within the complex include a swimming pool, kids’ pool, tennis court, and a karting circuit. The rooms feature a bath/shower, satellite television, kitchenette, refrigerator, microwave, safe, and a balcony/terrace (some features with charge).